Two International Automotive Components (IAC) Group employees dropped by Sale Creek Middle High School Friday to deliver solar eclipse glasses and Moon Pies to every student in the school. IAC Group is an automotive supplier with a plant in Dayton. 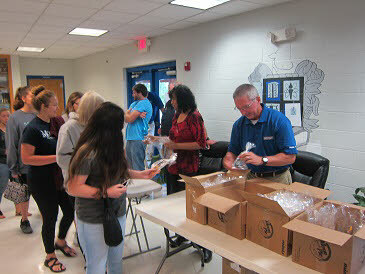 Human Resources Manager Jim Barrie and HR Assistant Kadie Bodden packaged the glasses and Moon Pies together, and then handed them out to each student as they headed to lunch. 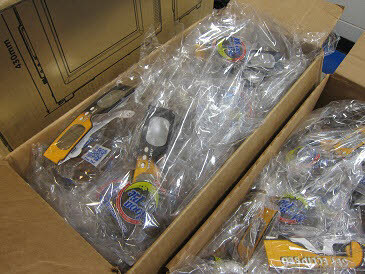 IAC Group decided to get the glasses for everyone working at the Dayton plant (around 550 employees). “The idea just grew from there,” said Ms. Bodden. The Moon Pies were included because a solar eclipse occurs when the moon moves between the sun and Earth, blocking the sunlight and casting a shadow onto Earth. "Now the SCMHS students have a snack cake as big as the moon to enjoy while waiting for the Earth’s moon to cast its shadow on Monday afternoon," officials said. Mr. Barrie and Ms. Bodden handed out the packets first to the high school students as they headed to lunch. About an hour later, they handed out the packets to every middle school student as well. Sale Creek is one of the communities falling within the path of totality for Monday’s eclipse. Residents will experience full totality for around two minutes shortly after 2:30 p.m.